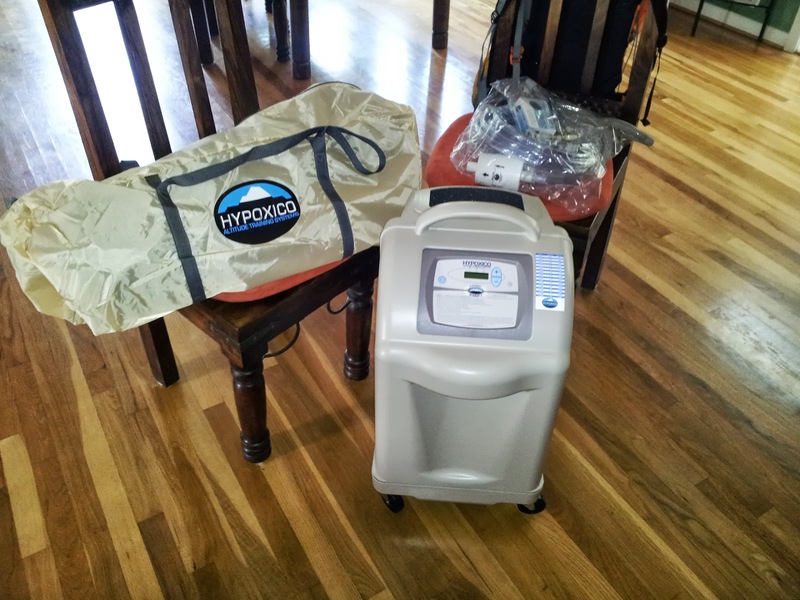 Prior to getting my Hypoxico unit, I used to acclimatize the old fashioned way - by earning it on the mountain. Hypoxic training also forces me to earn it but I earn the altitude at a more leisurely pace in the comfort of my own home. I get to eat home cooking, sleep in my own bed, and recover between training sessions with all the support my house, family, and friends provide. 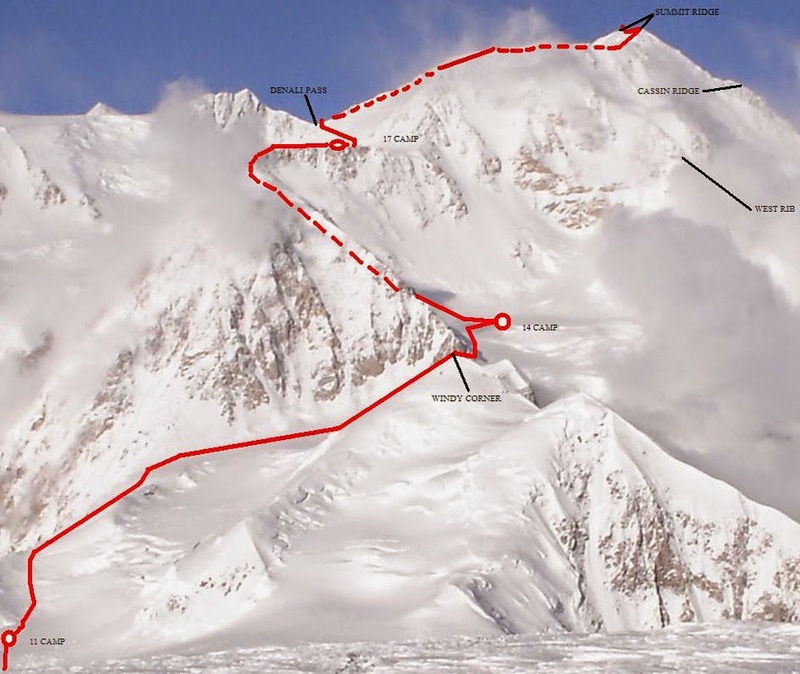 When I climbed Denali in 2011, I found the going pretty easy with a few exceptions. The first exception was between 14K camp and high camp (17.2K). The 3,000 foot climb on that day really zapped me. I was comfortable at all the previous altitudes but that day I eclipsed my highest climb to date and felt every bit of the altitude change. Additionally, I expected to be out for no more than 5 hours but the 11 hour ascent left me with little water and even less food. I vowed that day would be my last to struggle up a hill unprepared for the altitude. 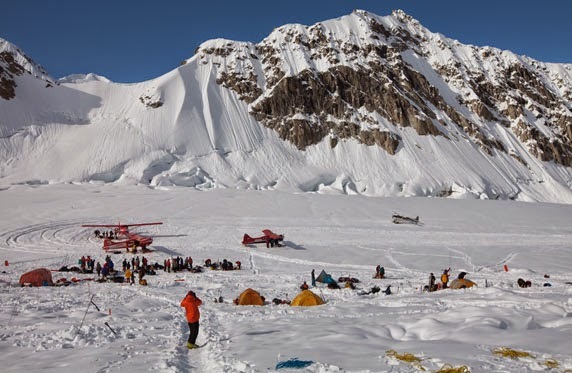 Denali was a brief climb - 11 total climbing days that included 2 full rest days and almost a full day waiting to fly out from the Kahiltna glacier. We made great time but I felt the altitude twice. Yes, once from 14.2 to 17.2 and the second time after I summited and had to wait for my climbing partner at Denali pass (for 4 hours). The dry air really affected my asthma and I had a rough descent on the Orient Express. Again, these problems prompted me to learn more about acclimatization and how to prepare more efficiently for high-altitude climbs. While on Denali, I ran into Brian Oestrike who stopped by our camp while trying to summit on a what looked like a casual weekend stroll for him. I wish I had a picture of his kit but it was almost too sparse to believe. He had the usual sled behind him but on that sled was his clean mountain can, a small parcel of gear, and some odds and ends. All told, he probably had 25-30 lbs of gear behind him while most of us had 80 lbs of gear on our sleds and an additional huge load on our backs. I leave it to Brian to set the record straight on the actual weight of his kit but suffice it to say that I am hardly exaggerating when I say his gear weighed less than 25% of mine. I had to know how the heck he did it. So I asked. Brian was and is an affable guy. He took the time to describe his training (in NYC of all places) and I immediately took note that I could do the same in Fairfax, VA. We chatted briefly and he headed on his merry way up to high camp. I returned home with a new-found vigor to pursue "at home" acclimatization and found his company on the web in no time. 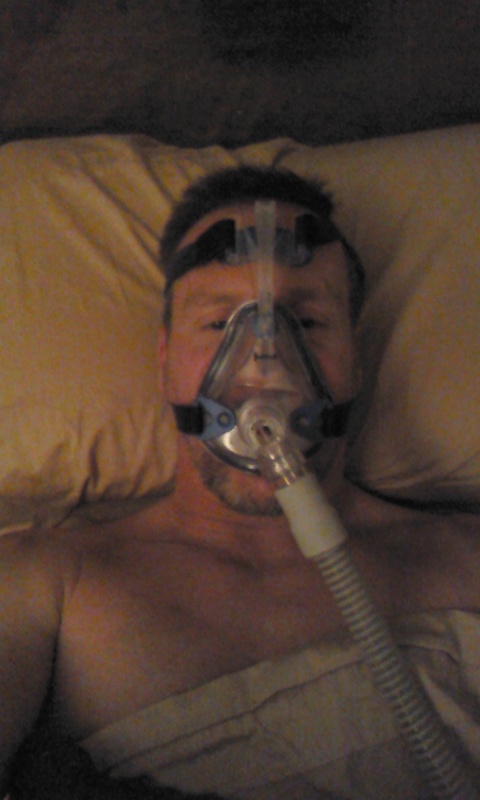 Once I did a little research, I promptly ordered a hypoxic unit, tent, and mask to try out. My do-it-yourself (DIY) acclimatization project began in earnest in June 28th, 2013. Yeah, it took me a while to make up my mind but I was ready to try out this experiment with full vigor once I got the equipment. 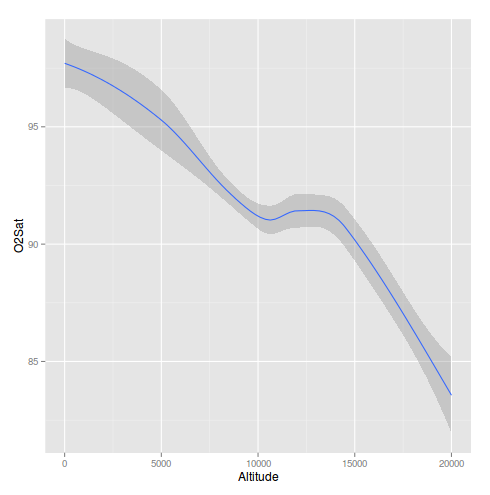 The blue line represents a smoothed (loess) relationship between altitude and percent oxygen (spO2 via fingertip oximeter) while the gray area represents the uncertainty around the blue line. My spO2 slowly dropped from KIA (7,800 feet) until 14,000 feet when I started to drink more water - almost forcing myself to drink a liter each night before falling asleep. Note that any value below 90% usually sends ER doctors into extreme action. For mountaineering, these values are not out of the ordinary. Dipping below 70% at 17,000 feet, however, provides some reason to be concerned. Note all values above are above 91%. I have yet to wake up with spO2 values below 90%. Now there are some reasons for these high values. I changed my acclimatization approach this year and intend to test the approach on Rainier and Aconcagua. Instead of pushing the envelope in the tent (live high - train low), I chose to train harder and higher - climb high - and then sleep low at about 12,000 feet. Below is a figure that shows my hypoxic training values. Nope. 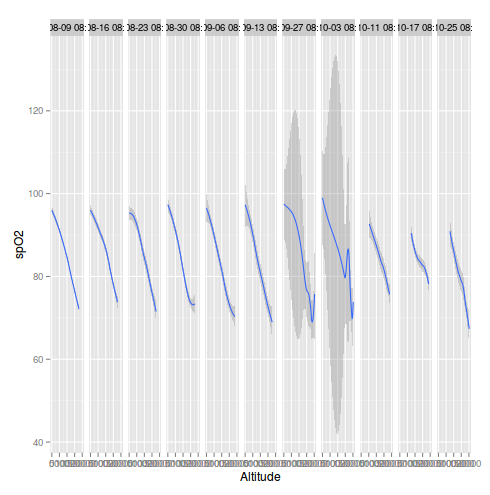 Looks like I am getting slower at the same altitudes; time to revisit this approach. Sleeping at lower altitudes might not be as effective as I expected. 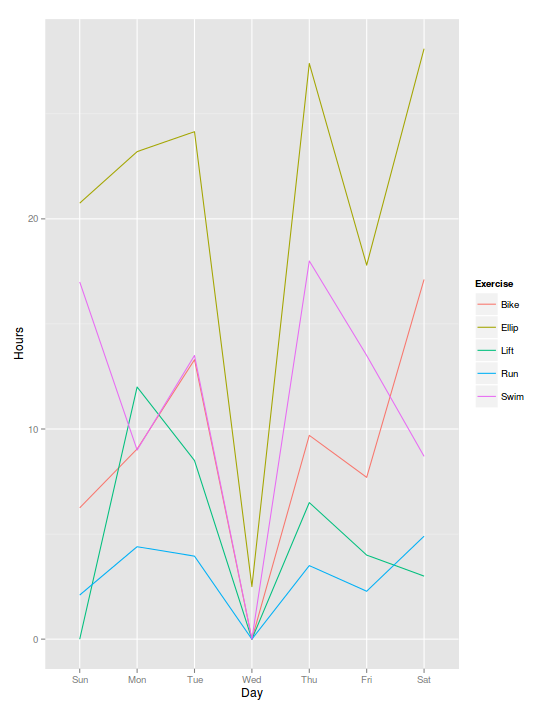 Despite the data, I intend to test out my fitness on Rainier and Aconcagua. My intent is to sleep higher as I go but right now I wanted to remain fresh at night, recover from the increasing workload, and train harder during the day. 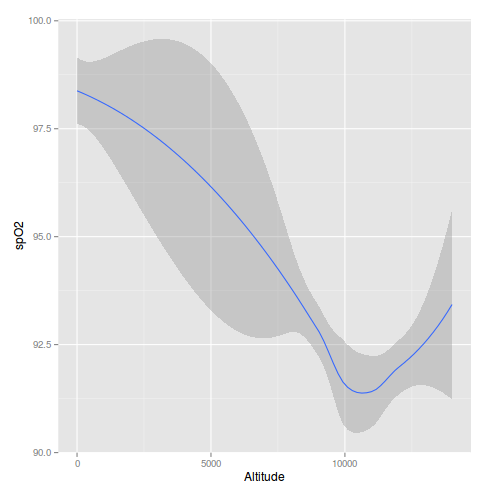 Obviously, something is not going right with my simulated climbs. I expected to be doing better each week. 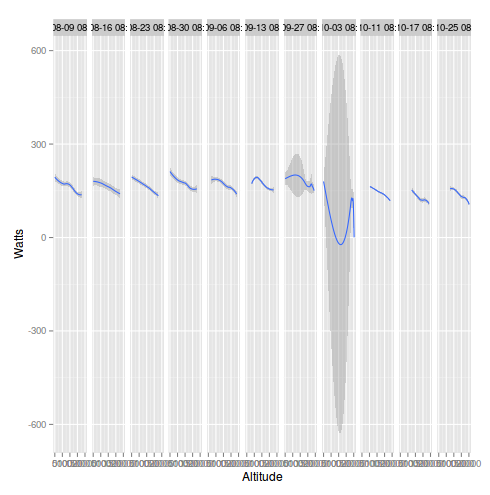 What the data indicate above is that my weekly simulated climbs are getting harder and harder. 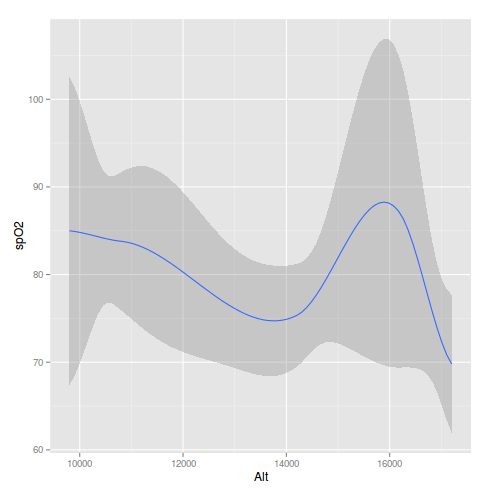 The anomalous data from October 3rd came from a simulated climb where I bonked. My comments from that day were "whoa! got off the bike; cut it short after I bonked." Well, that comment speaks volumes. So where am I now. I remain committed to test out this climb high - sleep low approach for the next few weeks before I take off for Argentina. I wanted to test this approach because sleeping in the tent at high altitude really affects my night's rest. Prior to leaving for Nepal last year, I averaged about 4 hours of good sleep at 20,000 feet. A few months of sleep deprivation (8 hours is my goal) might really affect my cognitive performance. Thus, I wanted to try a different approach. Sleeping low also allows me to continue sleeping in my own bed with my wife - both pluses in my book. Hope you enjoyed this long post about my current acclimatization routine. Stay tuned for a post about my gear for the three upcoming climbs. yes, imagine you were a reader who viewed your reading like many elitist alpinists view climbing. You might consider yourself a reader who has dared to read what others would never dream to undertake. You tackle James Joyce as "light reading" before you delve into the likes of Hegel or Woolf (see this list for some others). Your struggles through these tough reads empowers you to criticise others who dare crack open Joyce with the crutch of a reader guide. Those aided excursions into Joyce are not true to the author's intent; the true reader must struggle alone to get through the books. Your struggles must include a depth of misery and thoughtful reflection the authors intended you to endure. You are no reader if you cannot handle these tasks. Stop reading if you fail to live up to these standards. Sounds silly, no? Well, elitist alpinists think like this imaginary elitist reader. Note, I use the term elitist rather than elite because there are many elite climbers (alpinists, mountaineers, adventurers, etc.) who do not hold this elitist perspective. It is the elitist I am talking about here and I wanted to take a moment today to reflect on why I think elitism is bad for any activity. Note: Earlier this year, I posted a bit on elitism in sport. The current post is a bit of an extension of those ideas. "Consciousness of being or belonging to an elite"
What makes a person hold an elitist view? I have no clue. Well, perhaps a few clues. Perhaps these views come from some strong need to be unique and assert your uniqueness to others. Social dominance orientation (SDO; Pratto et. al 1994) may explain why some feel the need to be different and, more importantly better than others. Another explanation may be simply an individual's narcissism that drives them to this sense of superiority. I also understand the need to be appreciated. When an individual's orientation, personality, or need lead others to disengage in perfectly reasonable activities, I think it is time to call out the culprits. Today, I call them out for the sake of all those who enjoy climbing at any level. Do not let elitists ruin your time in the hills. Climb and enjoy the experience. Find others who enjoy climbing and share your experiences - ignore the elitists. A recent set of articles published by Forbes (start reading this link if you feel the need) really struck a nerve or several in me. Perhaps today's post represents a strong reaction to an individual and maybe my generalizations go beyond the vast majority but I witnessed sufficient evidence over the last year to warrant this post. The great Reinhold Messner compared Everest expeditions to Kindergarten. Perhaps the analogy is warranted given his extreme alpine expeditions but we all rely on some form of support in areas of our lives. I arrived at this point after reading many books written by (perhaps for?) and interviews of elitist climbers. Not all climbers espouse these views but there are some parade examples from recent publications. I find these elitist perspectives troubling. Why should we all hold ourselves to the same standards they set? Running, cycling, and triathlons all experienced and continue to experience elitists and their continued criticism of those who choose to endure rather than race. Why bother doing these events if you cannot win? Well, there is a great benefit. Training for these events helps you improve your fitness, health, and well-being. Sure, some take it a bit too far but most people get more positives out of the preparation than those who remain firmly affixed to their couches and remote controls. Training develops discipline and good time-management skills. Again, there are some who get obsessive about workouts and often let personal obligations slide in favor of a workout. Don't let these exceptions cloud your view of the positive benefits. We all benefit from participation. My primary point of this post is to emphasize that we all derive some benefit from being outdoors and being in the mountains. Would the elitists prefer none go outdoors to claim some benefit? Some people require more assistance than others but their experience is no less rewarding or challenging - to that person or even those who cheer them on - than any other's experience. We all make do with what we have and the extent that an expedition challenges us probably has more to do with what we were born with and where we grew up. In short, luck played a huge role in how hard these challenges are and there is no need to crow about luck. Forget celebrating luck, genes, and good fortune. Celebrate and support those who try to the best of their abilities. So climb and do not apologize for any assistance you seek out or rely upon. Know full well that many others admire your drive to get off the couch. 1. Everest 2015. I heard some great news from Dan Mazur today. His group - Summit Climb - is honoring our oxygen and (unused) Sherpa fees from last year while the Nepali government continues to promise that our $11,000 climbing permits are safe for this year (2015). In short, I am going back and now I have a better idea about the costs and timing. There are still a few fuzzy details but Dan's email to the climbers from 2014 seemed rather clear. He intends next year to be an inexpensive return for us all. I want to thank Dan and his group for coming to this concession. Last year was an odd one and I am sure it hit everyone pretty hard; I was just not willing to be among those who shouldered the huge economic burden. If I were independently wealthy and had tons of discretionary time, I might consider taking one for the cause but my finances/time are limited and I am I just so thankful that we did not need a protracted discussion with Dan to get a reasonable settlement. Thanks Dan. 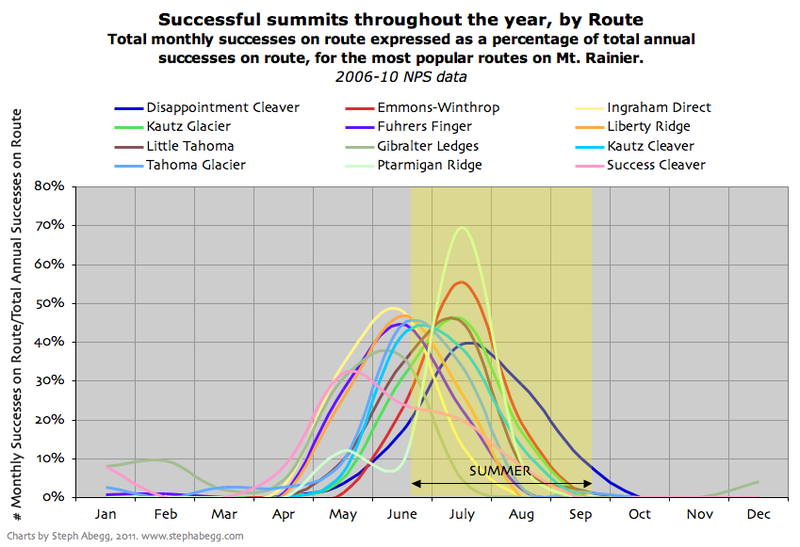 For those interested in climbing big peaks, remember the expedition teams like Summit Climb who treated their climbers well after last year. If you get a chance, please visit Steph's page. 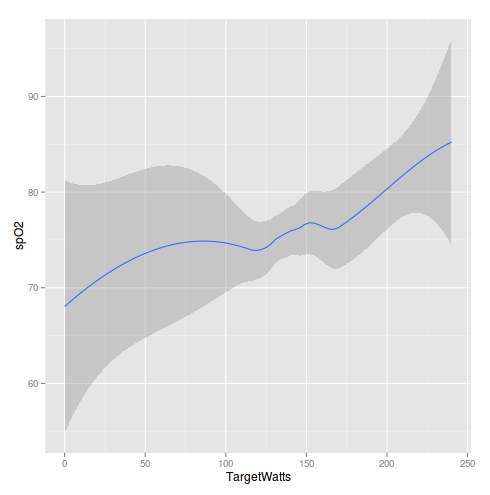 She was kind enough to let me link to her figure rather than forcing me to recreate the figure from the raw data. Thanks Steph. 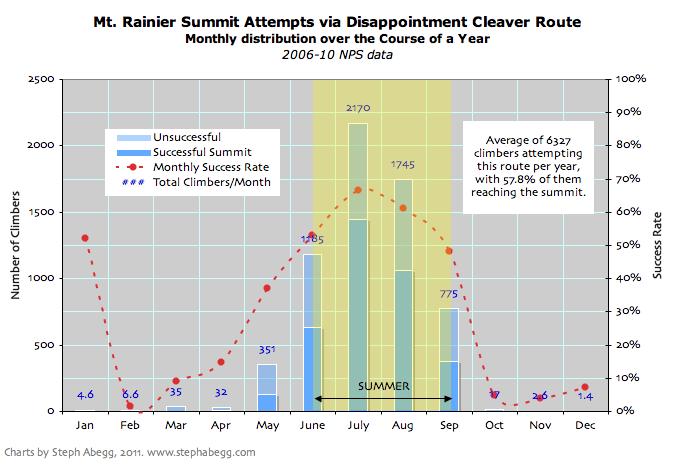 The blue curve that creeps most to the right is for the Disappointment Cleaver route. I will see how the route shapes up over the next few weeks. Suffice it to say, there will not be a ton of traffic on the hill when I get there in late November. My aim is to get up as high as possible without an overnight stay - one hard, fast/light push up the hill until I turn around and head for civilization. I just want to see how my legs and lungs handle the fast push up the hill. It should be a fun outing. Expect more details later as I figure out my route and gear list. 3. Argentina climbing in Dec. 2014 - Jan. 2015. Our flights are booked and the dates are settled now for our trip to Argentina. I land on December 6th and plan to get out to several ranges before I meet up with my family and Brendan Madden on December 20th. Here are some ideas I came up with while trying to figure out how to use my time alone constructively. 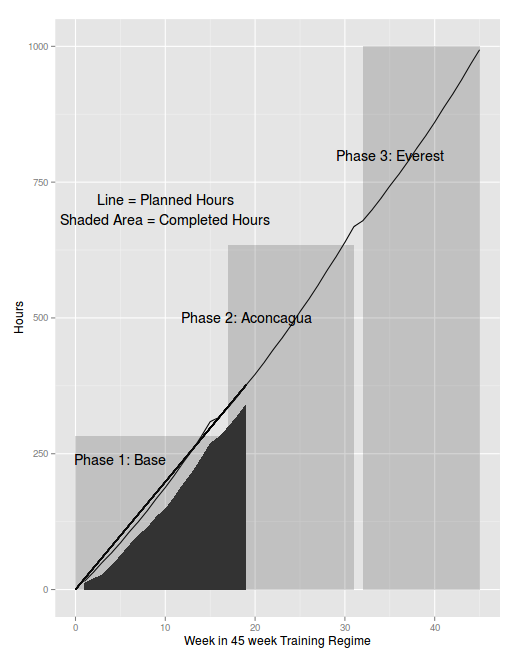 Option 1: Climb in the Cordon del Plata (CdP) range for 10 days. According to summitpost.org, the CdP is a "little sub range to Los Andes. 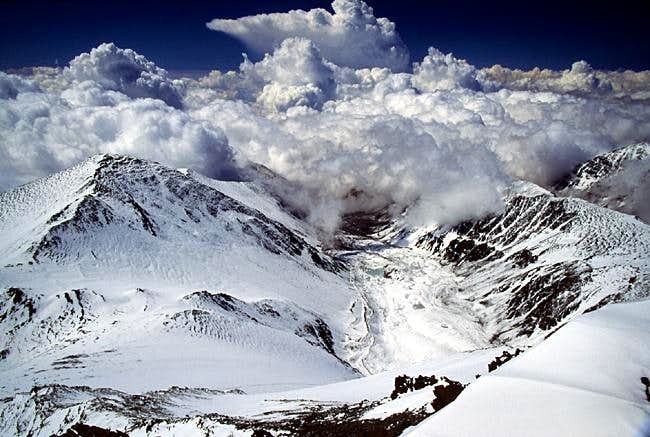 It's conveniently located along the highway which also takes you to Aconcagua, the giant of the South American peaks. The area has gained a lot of popularity in the last couple of years and many climbers use it as an acclimatization ground for the higher peaks. The easy access, the short distances in between the peaks and beautiful views has also contributed to CdP's positive reputation. There are lots of peaks within a few day's walk and even if most of them are easy scrambles along the normal routes, also more experienced climbers go here for some challenges." That route would require about 10-12 days and give me plenty of time on the glacier and high up on the hill. There are a few drawbacks to this second option and one major advantage. Drawback 1 (cost): One downside is that the Aconcagua climbing permits are good for 20 days and an early climb followed by my family climb would require two permits (roughly $1300 in total). The fees and logistics for the two climbs might make the two-climb push really hard on me both financially and logistically. Drawback 2 (limited adventure): Another drawback is that a more technical climb only allows me to see one mountain for the first four weeks of my trip. Granted, I could easily retreat from Aconcagua afterwards and explore the CdP alone when my family takes off in early January but I might prefer to rest and relax in sunny Mendoza after climbing with my family. Major Advantage (lower stress with family and friends): A big climb before the others arrive cuts the stress on me during their climb. I want to see the summit and they may not be as enthralled with the summit push as I am on summit day. Option 2 seems more appealing at this point but I need to figure out the logistics for mules, food, and transportation before I jump into another route - especially a more technical route that I would solo. Additionally, the mountain may dictate the options more than my preference. If unstable snow or poor ice conditions exist then a solo ascent up the Polish Glacier Direct would be foolish choice. I expect a return trip no matter what the conditions so prudence trumps preference. 4. Training going well. Yep, not much to report. I remain fit, fat (relatively speaking), and happy with no injuries to report and an overall good attitude that dominates my current situation. I am so excited about the upcoming climbs that I can barely focus on much of anything else....but I do continue to chip away at the piles (megabytes perhaps?) of papers to write and grants to finish. 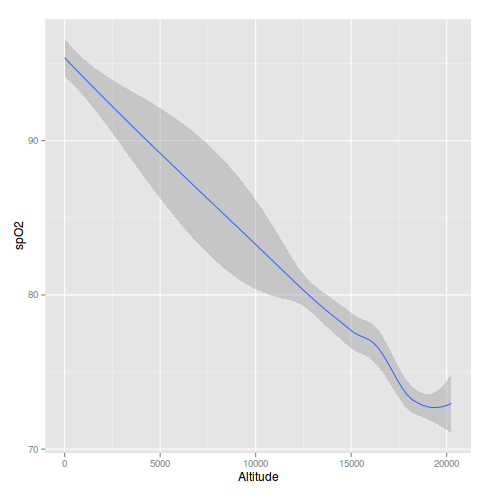 I plan to detail my acclimatization formula based upon a ton of data from myself and others. Expect some graphs and formulas to appear in the blog shortly. Gear check for the climbs to be laid out and explained in some detail. Each climb requires slightly different gear. Rainier requires a fast and light kit - not much to bring for a one-day push; Aconcagua requires a much more extensive kit for the potential two-climb expedition; finally, Everest requires a ton of gear but this year will be trimmed down substantially from last year. Lightening my load for all climbs will be my focus for the next few months. I examined each piece of gear and started fixing, replacing, or retiring anything that does not serve multiple purposes. More on these later. Thanks for reading and feel free to post any opinions on my options or provide other options for Argentina. I'm open to other ideas. See you next week. October 8th, 2014: I'm going climbing...soon. Yep, I look a little weird but hey, I'm sleeping. Who is gonna notice my strange looks other than my wife (who knows all my quirks already). 2. Working on acclimatization index. Many of you know that my work focuses on measurement. I'm sure you all got the hints from my previous blog posts with countless figures showing my progress. I wanted to figure out how well I was progressing with my training - particularly my acclimatization to different oxygen levels. The progression needed to be expressed in terms of oxygen level (the predictor) with spO2, HR, and power (in Watts) as the outcome. Some combination of the three outcome measures ought to communicate the extent to which I can accommodate the hypoxic stress. Here is what I have come up with so far. Feel free to comment on the blog if you have any other ideas. The additivity of these three components, however, is not clear to me and certainly not clear in the literature. If I simply add them then the more variable components will be far more influential than the others. Consider the simple problem of figuring out BMI (wt in kg / height in (squared)). If your height does not change then all changes in BMI are attributable to only your changes in weight. Thus, I need to weigh these three components in a logical way that does not favor one over the others - unless, of course, I wish to weight them unevenly. Expect a full post on this topic shortly. 4. Fat is where its at. Despite all the training, I successfully maintained my weight at 175 lbs (79.4 kg) and intend to stay at that weight for the duration of my training. Last year I struggled to get my weight back up after I lost a ton during my intense training. I learned from my mistakes and decided to back off the intensity a bit and focus more on hypoxic training earlier to reduce the intensity of my workouts. The net result of this change is that I am equally fit but now I maintain a little expendable weight that I am sure to shed during the first week at high altitude. Beer and chips are now a staple in my daily diet. That is about it. More news to come shortly as I prepare for my climb on Rainier and then onto Aconcagua. See you soon and thanks for following.